I was at at church on Sunday with my girls, in the hall because the chapel overflow was crowded, hot, and I didn't think starting three hours of meetings with cranky children would be in anyone's best interest. While my girls spun around and colored, other parents filtered past with their kids. One woman stopped for a bit. I don't know her well, but I did recognize her from all the time I spent in the mother's room with my son when he was younger and eating every hour. She had a little girl about his age that she was currently walking the halls with. I talked to her for a minute, all friendly small talk, mentioning her little girl and the fact that she was now in nursery (our church's class for children 18-months to 3-years-old). She said something about my little boy being able to attend soon as well, and asked how she thought he would do. I said I thought he would be okay, but only because his sister would be in there with him. Her: So... are your kids adopted? Me: My girls are, yes. Her: So your son... (Suddenly grinning.) Is he just a miracle baby, then? Her: So did you just not think you could get pregnant at first? Me: We wanted to adopt. She sort of half-smiled, clearly uncomfortable, and walked away soon after. I don't doubt that I made her uncomfortable. She was probably expecting me to engage in a way that was, I don't know, nicer? In the past, I might have. In the past, I have answered questions that are really no one's business to ask regarding adoption, infertility, race- whatever- and afterward, wondered why I did. 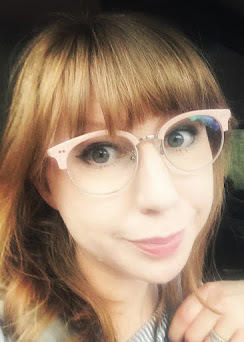 I tried to work it out in my mind, thinking that they meant well with their comments and questions, they just didn't have the right "language"; they didn't mean to be offensive; they didn't know how to best get their point across because it wasn't something they were completely familiar with. The reality is, people pry. They ask questions they have no place asking, expecting information they aren't entitled to that will in no way benefit them. And yet, I have felt obligated to not make them uncomfortable; I have felt obligated to extend the benefit of the doubt. By far, the biggest reason for no longer doing so is my children. They are usually standing right next to me when these sort of comments are made. I believe that what I don't say speaks far louder to them than what I do. Letting comments slide, or purposely ignoring them can, and will, do a lot of damage to a little mind that sits and mulls it over- hours, days, weeks, or even years after. I don't want my children to wonder why I didn't stand up for them. I don't want them to wonder if what a stranger (or friend, or relative- no one is exempt), has assumed about them, or our family, or an important cause to us is true. I don't want my children to hear someone say, "Oh, you know what I mean," and think that their mom does, in fact, understand where a misinformed statement is coming from, or worse, agrees with it. I don't want them to think that I put someone else's comfort above their privacy, their feelings, or what is right or true. On that note, it is ridiculous to me that someone can say something rude or potentially upsetting, then, when called out on it, turn it around so that they are the one who needs comforting. Like, "Oh, I am so sorry to have not known I shouldn't have said such a dumb thing. Please console me lest I feel like an idiot." So I don't offer the benefit of the doubt. I don't assume that insensitive comments or prying questions were well-intended. I can offer a straightforward answer, if it's at all warranted. Facts, if they're relevant, particularly if you are attempting to engage in a discussion based solely on your opinions. I can offer discomfort, and not just because I like to see people squirm after saying something dumb. If you can sit with your discomfort and acknowledge it without jumping to the defensive- really try to understand just why you are uncomfortable- you will find that's where you begin to learn; it's where you will begin to grow and gain a deeper perspective and new understanding. If you want to, that is. Extending the benefit of the doubt is just not beneficial. It closes the door on understanding. It sets the precedent that anything short of an outright insult will get you a pass, just because you're generally a nice person. It absolves someone of taking ownership of their words and actions and prevents a closer look as to why another person might find something to be insensitive. Which, can we talk about this? Why are we so quick to call someone oversensitive? Is it that far-fetched of an idea that we are human beings, with different ideas and emotions, and we are all deserving of respect? What is important to one person isn't important to everyone, but it is key to recognize that you not caring for something makes it no less significant to someone who does. You don't have to understand something completely to respect it, and that holds true to the deeply held beliefs and convictions and experiences of others. Think about what you say. 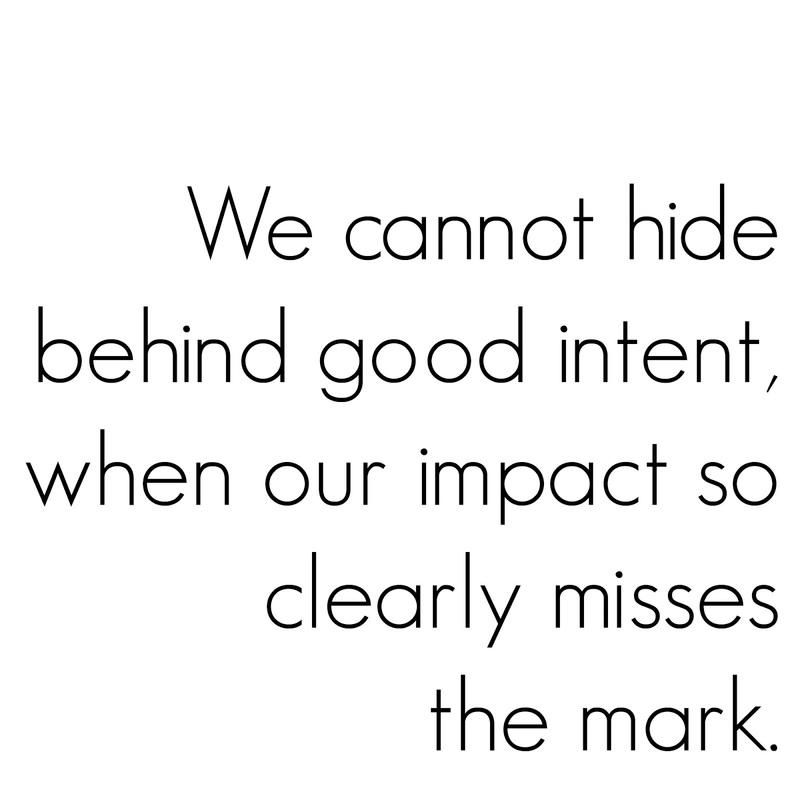 Choose words that are truly indicative of the message you intend. If you are struggling to articulate something, acknowledge that. Make your words count instead of banking on an, "Oh, you know what I meant," because, unless you meant to be insensitive and shut down further discussion, no, I don't know what you mean. Most people are happy to teach and engage in discussions. I am. I believe, though, that we need to first be truly open to learning, to be able to sit with our discomfort, before we begin. 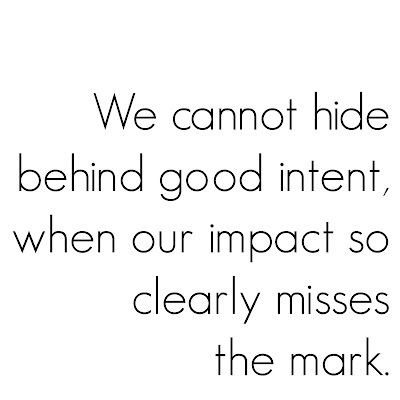 We cannot hide behind good intent, when our impact so clearly misses the mark.